The Institute carried out a large amount of work on the development and implementation of technologies for reducing energy consumption and reducing emissions of toxic substances and greenhouse gases in the environment in the processes of heat energy production. Among the developments of the Institute new technologies and equipment for reducing the formation of nitrogen oxides in the process of combustion burned twice with the possibility of further refining; to reduce emissions of sulfur oxides twice by the semi-dry method; cyclophilic filters, including the possibility of a built-in sleeve filter, for dust removal with a coefficient of 99,9%; technology of combustion of organic substances in ventilation emissions; new generation hot water boilers (0.63 and 2.0 MW); heat recovery, air heaters; modernized podium emitting gas burners; intensification of furnace heat exchange; improvement of technology of combustion; reduction of emissions of toxic substances and greenhouse gases into the environment; reduction of energy consumption in the process of production of thermal energy, etc. Some of these technologies and equipment are developed and implemented jointly with the Institute of Gas and Technical Thermophysics of the National Academy of Sciences of Ukraine, the European Institute for Sanitation, Safety, Insurance, Equipment and Environmental Protection (SVT eV, Saarbrücken, Germany), E3 International (USA) , E-Energy group (Lithuania), as well as with colleagues in Russia and Belarus. A number of developments of the Institute were recommended by the Ministry of Housing and Communal Services (Ministry of Construction) of Ukraine and implemented in the municipal heat supply systems of the cities of Kyiv, Zhytomyr, Vinnytsia, Sumy, Zaporizhia, Dnipropetrovsk, Kharkiv, Lugansk, Simferopol, Yalta, Sevastopol, Gorlovka, Khmelnytsky, and others. In addition, the Institute’s developments have been implemented at the industrial enterprises of Kyiv, Volyn, Vinnytsia, Chernivtsi, Kharkiv, Chernigov, Lviv, Donetsk and Khmelnytsky regions, as well as Russia, Belarus and Lithuania. Development of technical and working documentation for a water-heating water-tube boiler of 2 MW capacity. 2002-2003. Development of technical and working documentation for a water boiler of 0.63 MW capacity. 2004-2005. Development of elements of the construction of a water-heating water-tube boiler with the capacity of 1 MW. 2003-2004. Development of a set of design documentation for the underarm modernized burner to the boiler TVG-1,5. 2004-2005. Development of technical and operational documentation for heat utilization to the boiler KVB-2,0GN. 2005-2008. Development, author’s support of manufacturing and installation, commissioning and commissioning of a heat recovery unit to the boiler TVG-8 of the boiler-house on the street. Belova, 6, m. Chernigov. 2007-2008. Completion and transfer of design documentation for equipment for reducing CO2 emissions at the expense of fuel economy: a heat recovery unit for 15,000 m3 / year of exhaust gases. 2008-2009. Modernization of the boiler PTVM-50 with the installation of an additional bottom burner for boiler productivity increase. 2008-2009. Completion of design, manufacturing and installation of additional sub-burner in the boiler PTVM-100. 2006-2009. Completion of design, manufacturing and installation of additional sub-burner in the boiler PTVM-50. 2006-2009. Development, manufacturing and delivery of two cyclophilic filters TskF-4 (aspiration of technological line of printing of wallpaper). 2012 – 2013. As part of the work on projects for the reconstruction of district heating systems in the regions and cities of the country, an analysis of the state of the heating equipment of the communal services of the region was carried out through the survey of equipment for boiler houses and heating networks, an assessment of the efficiency of its work on the volume of fuel consumption and productivity. The method of preparation of materials for the region’s municipal utilities equipment database is developed. Many years of experience of the Institute’s specialists are used to develop numerous projects and regional programs for the reconstruction of municipal heat supply systems in the regions and cities of Ukraine. The specialists of the Institute took part in the development of the Regional programs for the modernization of municipal heat and power engineering in the Autonomous Republic of Crimea and several regions of Ukraine (at the request of regional state administrations). In 2008, the Institute received a Certificate of Enactment of Energy Audit, which was reissued in 2012. Currently, licensing of this activity has been canceled in Ukraine. Since 1998, the Institute has been involved with issues related to global climate change, greenhouse gas emission reductions and the Kyoto Protocol to the UN Framework Convention on Climate Change (UNFCCC). According to the Ministry of Housing and Communal Services of Ukraine, the Institute carried out an expert assessment of the potential and opportunities for reducing CO2 emissions from the district heating utilities in Ukraine. The Institute has developed the first draft of the Joint Implementation of Ukraine to reduce greenhouse gas emissions by reducing fuel consumption as a result of the reconstruction of the district heating system in Chernihiv Oblast (2003). The ability to create joint implementation projects in accordance with the Kyoto Protocol’s mechanisms to the UNFCCC to reduce greenhouse gas emissions by reducing fuel consumption as a result of the reconstruction of communal heat supply systems in Ukraine was ensured through the development of specialists from the Institute of Industrial Ecology LLC, together with experts from the European Institute of Sanitation , safety, insurance, equipment and tools for environmental protection (“SVT eV”, Germany), a specialized methodology for determining the baseline monitoring and monitoring of such projects. This methodology was approved by independent internationally recognized expert organizations, and it was with its use that the design and technical documentation (PDD) of all joint implementation projects for the reduction of greenhouse gas emissions for district heating enterprises in Ukraine was developed. 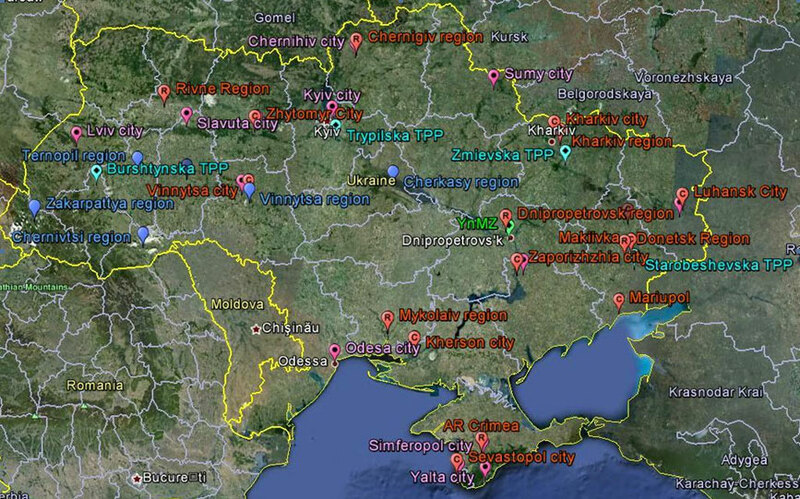 The Institute developed the JI projects for the reconstruction of district heating systems based on their own methodology for a number of regions (Autonomous Republic of Crimea, Chernihiv, Donetsk, Dnipropetrovsk, Rivne, Kharkiv oblasts) and cities (Kharkiv, Lugansk, Zaporizhia, Vinnytsia, Lutsk, Kyiv, Khmelnytsky, Sevastopol, Makeyevka, Mariupol, Artemivsk, etc.) of Ukraine, as well as projects for the reconstruction of water supply systems in the Autonomous Republic of Crimea, Vinnytsia and Lutsk, on energy efficiency improvement of thermal power stations (Starobeshivsk , Tripoli) with recovery of small hydropower plants in different regions of Ukraine, collection and utilization of landfill gas at the landfill c. Chernigov, the implementation of energy saving equipment and technologies in industry, including the SE “PA Yuzhny Machine-Building Plant. O. M. Makarov “, etc. The PDDs and periodic reports on project implementation monitoring were reviewed by the International TÜV SÜD, Bureau Veritas Certification and TUV Rheinland accredited independent international expert organizations. In total, more than 30 JI projects were developed, of which 15 were already transactions of emission reduction units (about 14 million tons of СО2eq. ), As a result of which the enterprises of the country received significant (more than 500 million UAH.) Targeted irreversible investments in their activities. Reconstruction of the heat supply systems of the cities of Makeyevka, Mariupol, Artemivsk, Donetsk region (energy saving measures) 2008 – 2013. Rehabilitation of the District Heating System of Zaporizhzhya City (Energy Saving Measures) 2008 – 2013. Reconstruction of heat and water supply systems in Vinnytsia region (energy saving measures) 2000 – 2013. Reconstruction of heat and water supply systems in the city of Lutsk (energy saving measures) 2012 – 2013. Reconstruction of heat supply systems in Dnipropetrovsk region (energy saving measures) 2003 – 2013. Rehabilitation of the District Heating System in Sevastopol (Energy Saving Measures) 2004 – 2010. Rehabilitation of the District Heating System in the City of Khmelnitsky (Energy Saving Measures) 2000-2007. Rehabilitation of the heat supply system in the city of Kherson (energy saving measures). 2004 – 2009. Rehabilitation of the District Heating System in Zhytomyr City (Energy Saving Measures) 2006 – 2009. Reconstruction of the district heating system in the city of Odessa (energy saving measures) 2004 – 2009. Collection and utilization of landfill gas at the Chernihiv landfill (using landfill gas instead of natural gas at a heating boiler house in the city of Chernihiv) 2006 – 2012. Reconstruction of Block No.9 of Zmiyiv TPP of OJSC “Tsentrenergo” 2006-2007. Reconstruction and technical re-equipment of Starobeshivska TPP of the Donbasenergo OJSC. 2007-2009. Reconstruction and technical re-equipment of the Burshtyn TPP of the Zakhidenergo OJSC. 2008-2009. Utilization of Coal Mine Methane at the State Enterprise «Coal Company« Krasnolimanska ». 2008-2009. Since 2015, the Institute has been involved with the preparation of the country’s enterprises for work in conditions of Ukraine’s compliance with EU directives in accordance with the Association Agreement between Ukraine and the European Union, in particular Directive 2003/87 / EC on the establishment of a scheme for greenhouse gas emission reductions, in order to ensure the possibility of obtaining permits from the enterprise for greenhouse gas emissions and corresponding participation in the trading system of emission permits as well as Directives 2001/80 / EC “On limitation of emissions of certain pollutants in atm the field of large combustion plants “and 2010/75 / EC” On Industrial Emissions (Integrated Pollution Prevention and Control) “, which regulate the emissions of nitrogen oxides, sulfur oxides and particulates, in order to determine the applicability of the requirements of these Directives to the objects of enterprises and emission reductions to their requirements. According to the tasks of the Ministry (State Committee) on Housing and Communal Services of Ukraine, the Institute of Industrial Ecology has been engaged in many scientific and technical works for the past 16 years, mainly in the field of municipal heat and power engineering. “Expert assessment of the potential and possibilities of reducing СО2 emissions to the atmosphere by the enterprises of district heating of Ukraine”, 1999. “Integrated technology for increasing the efficiency of fuel use and reducing emissions of toxic substances into the atmosphere by industrial and heating boiler houses of Ukraine”, 1998-2000.